Baal HaSulam, “The Wisdom of Kabbalah and Philosophy”: Philosophy loves to concern itself with His Essence and prove which rules do not apply to Him. However, Kabbalah has no dealings whatsoever with it, for how can the unattainable and imperceptible be defined? Kabbalists do speak a great deal about His illumination in reality, meaning all those illuminations they have actually attained, as validly as tangible attainment. Kabbalists attain an abstract Light when it dresses into vessels and turns from a theoretical form to a tangible structure by manifesting Itself in us as various features of ours. It is said that “we do not define by name or word that which we do not attain.” We attain everything there is by analyzing it in our vessels of receiving. They are our “eyes,” our vision, the channel through which we perceive the world. Only on condition that we know a certain phenomenon can we explore it to the degree of our immersion in it. Thus, we advance. There is a rigid principle: “We shall know You by Your deeds.” That’s why we always rely on our perception within our vessels, desires. Our internal reactions to them are in fact the Light. Similarly, we recognize electricity not by its essence, but according to its results. Something flows through wires and generates various phenomena. All we see are the results. Baal HaSulam writes about it in his article “The Essence of the Wisdom of Kabbalah.” Actual things are found even in the corporeal reality set before our eyes, although we have neither perception nor image of their essence. Such are the electricity and the magnet, called “fluidum.” Nevertheless, who can say that these names are not real, when we vividly and satisfactorily know their actions? We could not be more indifferent to the fact that we have no perception of the essence of the subject itself, namely electricity itself. We always explore the consequences of various essential categories, rather than deal with the categories per se. I have no idea what the subject that I look at is in fact, but I know how it acts. All I do is check my sensations and reactions: Something looks black to me, other things feel solid, some are long, and certain things I can taste or smell. Reality is comprised of my internal reactions to outer impacts, rather than the factors that cause them per se. Therefore, phenomena that we differentiate are actually the effects that externality causes in us. Why do philosophers refuse to admit it? The answer is that it will obligate them to become Kabbalists and study the Wisdom of Kabbalah in order to explore spirituality. Common sense prompts that they don’t know or understand a thing and have nothing to say. Really, what can one say if one doesn’t live in spirituality, nor does one sense It in one’s vessels, desires? We shouldn’t approach Kabbalah with a regular human mind; we are not in the dimension that Kabbalah describes as of yet. We can fantasize about what’s inside the Earth and imagine life on other planets since these things are at least somehow interlaced with our sensations. However, they have nothing in common with spirituality. Moreover, we don’t have any connection with the spiritual realm: Our material reality as we see it is absolutely detached from the picture that is created in our minds. How can we deliberate about something that we have no contact with whatsoever? This is one of the reasons the Wisdom of Kabbalah was concealed from humanity throughout millennia. Kabbalists were afraid of “smart alecks” who just tended to philosophize about the topics that are related to Kabbalah. It also applies to the philosophers who valued Kabbalah, such as Reichlin, Goethe, Pico Della Mirandola, and others. Even these people did not understand a thing in the great wisdom, nor could they realize that the general universal knowledge that is beyond traditional disciplines originates from Kabbalah. What they proclaimed is in fact nothing but philosophizing. Some philosophers approach Kabbalah with critical analysis that is based on a subjective approach, others admit its importance, although none of them understand it. Their position lacks rationalism that is so much needed. Nevertheless, the truth will be revealed soon; we are very close to it. Answer: It is quite difficult since we can’t just do nothing, but rather we have to accept everything that happens in a totally open manner, gladly, and see that it comes only from the Creator, not to examine it, criticize, or assess it. This is very complicated. Apparently there is nothing special here, just live freely and rejoice at everything. But in fact there is nothing more difficult than this. It isn’t easy to go with the flow, since in this case you need to be in absolute unity with the Creator. Absolutely! While he puts you in such circumstances in which you find yourself in states that are contradictory to Him, disagreeing with the world, with this life, with the problems that constantly trouble you! You constantly disagree! There is always something that makes you feel bad. This is done on purpose from above. How can you accept everything calmly and flow with the current? Only by changing yourself! There is no other way! This is the problem. This is how you attain a peaceful tranquil world—when a person totally annuls himself and adheres to the Creator. This type of rest is relative since a person advances quickly above the speed of light by going through an infinite number of changes. At any given moment he goes through billions of changes according to the upper Providence, in total acceptance, thinking logically, engaging only in what suppresses his ego and rising above it, thus entering a state of absolute rest. This is opposite from the concept of rest that we refer to today. This refers to the right and left lines. Which of them is weaker? Altruism is considered to be weaker compared to the ego; the ego is stronger. You don’t have to lean to this side. First, you cannot do this. Second, you don’t need to do this, as long as you have not raised the weak side to a level where it will become so important to you that the two lines will be equal, and then you can make a judgment in spite of it all. Our role is to raise the “right line” to a significant level. Here there cannot be any inclination to any side: not to the right and not to the left. This is not as it is in other religions and beliefs. As long as the two lines are not balanced as in a scale, you cannot make a judgment. But how is it possible to make a judgment if they are equal? Which of them is correct? Neither! Take both of them and raise them up. Only there does the vertex of the triangle join them like two opposites that can only connect above, on the next level. This is the entire judgment, when you establish precisely that there is no possibility for deviation, the two lines are absolutely equal! I don’t see any preference for this versus that. And so the need for elevation is discovered. And until then, only words, but not a necessity. On the next level the same thing happens. The mechanics of all the levels is identical. Question: The term “groups of ten” cannot be grasped by my group, and we don’t talk about it. There is a kind of collective agreement that the group of ten and the group are two different things and that the group of ten belongs more to dissemination. But when we discuss dissemination no one talks about the groups of ten. Why does this happen? Answer: On the whole I don’t know what the difference between the group of ten and the group is. A group of ten is a collection of people who can connect and then separate. A group, however, is more organized, fixed, and connects people. It creates certain conditions around it: It has a building, a certain kind of work, a group is more stable, solid, and versatile. A group of ten can be organized spontaneously, in order to clarify a certain problem for example. If ten friends who are not in a hurry to get to work now get together, they form a group of ten. I believe that the groups of ten shouldn’t be fixed. Different members in my group, in the global group, in another group can be members of my group of ten. This morning it is one way and in the evening it can be different, etc. This means that the group of ten is a method of getting together, in order to ascend, to solve a specific problem, to pray, and to form an intention. When people are about to go out to perform a certain activity they gather, and this gathering can also be called a group of ten. A group of ten is called Minyan in Hebrew, and it stands for a Sefira. It is customary to pray only in a Minyan, (in a group of ten people). 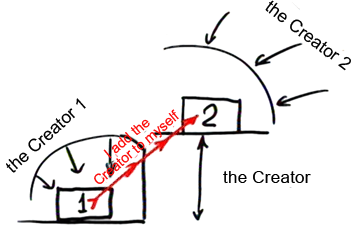 This means that in order to turn to the Creator, we have to be at least ten people. When the group is smaller than that, its prayer is not accepted since one person cannot raise his personal egoistic desire to the Creator. 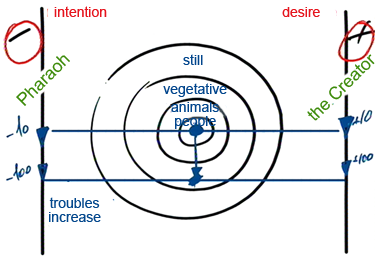 When he annuls it in order to connect to others and they do the same with regard to him, a collective desire is created among them, a common intention. Such a group of ten has a special attribute, since the spiritual levels are in an identical relation to each other, and the group of ten on the first level is equal to 1 on the next level. So in order to ascend from one level to the next, we have to establish such a connection that all the ten people will be as one. This is the whole idea of the spiritual work. So a group of ten is called Minyan stemming from the Hebrew word meaning numbered. So the difference between the group of ten and the group is very clear. A group of ten is a spontaneous collection of people who have a special desire to connect and to draw away from their ego. The ego throws each of them backward and then they connect internally against it, yearning to unite. This means that the “raspberry ball” is the sum of the efforts to connect (Σ). It turns out that each one feels that he is in the circle in the group of ten, detached from himself and connected to the others. Psychologically I have ascended, flown, exited myself, but in fact I have not exited myself to some space and am not flying somewhere meditating. I am together with the others in a special volume of the collective efforts and our common yearnings. It is in this state that the yearning for the Creator is created. 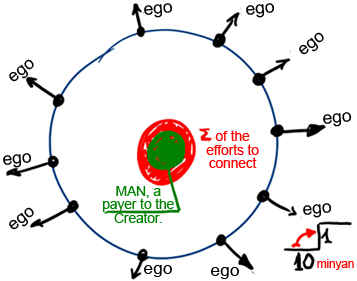 Our collective inner efforts (the next circle) are not just efforts, but MAN, a prayer to the Creator. All of reality except for us is found in a state of rest and waits for our work. Everything is seemingly evolving and changing at every moment, yet without any free choice. The result of the cooperation between the Light and the Kli that is found opposite to it, is projected, extended, and evolved downward, and influences the world more and more. The link between the Light and the Kli in the meantime is created without our participation, without an attempt to establish a proper link between them. And if we don’t link them correctly, then these two lines of force will evolve further and further downward, in parallel to each other, and will influence us who are found between them. The entire world is found in a field between these two forces, plus and minus: still, vegetative, animate, and speaking (humanity) and within it also Israel. The positive and negative forces evolve further and further from above to below, meaning they are revealed one against the other with greater and greater intensity, where the minus and the plus are made more opposed to each other. And if we, with our free choice, cannot link and complete them in the right way, then they will descend to an even lower level and cause more and more trouble. As if there was a -10 tension opposite a +10 tension, and this becomes -100 opposite +100; that is, the opposition between them is made much greater. Therefore the troubles grow and become greater, and then we have no choice, and they oblige us to make some kind of link between the plus and the minus. If we create a link like this, then the entire nature of the still, vegetative, animate, and all the nations of the world, also merit a more balanced supervision, which is to say a quiet life. There is no longer such strong opposition between the minus and the plus, rather the opposite; there is something that links them together. The positive force supplies intention and the negative force supplies desire, and if we combine intention and desire correctly, then all of of creation will enjoy the fruit of this covenant. That is how it works. All of the negative egoistic forces, all the wicked (Nebuchadnezzar, Amalek, Hitler), which collectively are called “Pharaoh,” have no free choice. Therefore, there is nothing to curse or blame them for; rather, it is necessary only to understand that nobody can correct the situation except those who have free choice, that have a natural inclination towards correction of the world.